Most fellows and affiliates agree that iterative success along the research process continuum keeps attention to rigorous details such as validity and reliability a top priority. Indeed, the research process is long and arduous. This year, like others, finds some Center for Leadership Studies and Educational Research (CLSER) fellows and affiliates that continue to get “CLSER” to collecting their rigorous study results or remain cautiously optimistic as they await peer reviews and important feedback. Others, however, have reached the pinnacle of success, boasting scholarly publication and presentations at tier one conferences, a job well done. Where to begin? Senior Fellow, Lynne Devnew, D.B.A., wraps up the year as the prestigious recipient of the Distinguished Scholar of the Year at the annual 2017 Knowledge Without Boundaries (KWBA) conference. Held in Tempe in July, the University of Phoenix conference featured scholars whose peer reviewed studies and best practices add much value to the classroom, literature, and field. Dean of Research and Scholarship, Mark McCaslin, Ph.D., said Dr. Devnew displayed, “Unprecedented dedication in her role as distinguished Fellow.” Devnew is the voice of Women & Leadership Research Group which although based in CLSER, includes affiliates from all research centers. Follow all that Senior Fellow Devnew has achieved with her highly visible “Affinity” role via the International Leadership Organization (ILA) in this earlier story. Numerous scholarly credits kept Dr. Devnew active throughout the 2016/2017 academic year with another culmination, a book chapter within The Handbook of Research on Gender and Leadership. In the spring, CLSER celebrated a milestone, its 300th affiliate: Debra S. Sandberg, M.B.A., Ed.D. The notable School of Advanced Studies chair had much to celebrate. Sandberg, a Central Florida University of Phoenix associate faculty, and coauthor Michael A. Lindquist, Ed.D., Central Florida, University of Phoenix campus faculty liaison and veteran lead faculty area chair, will be presenting the results of their research, A Study of Trust in Global Leadership in Turbulent Times, at the 19th Annual International Leadership Association conference (External link: Features a database of all scheduled presentations searchable by last name) in Brussels this fall. Nearly 20 University of Phoenix scholars including Yvonne Phelps, V.P., recent School of Advanced Studies (SAS) grad Dr. Jim Turner, will present of which the majority borne from CLSER. The Detroit Main Campus affiliates revved their scholarly engines too. Detroit’s Domonique White, CLSER affiliate, led her team along with Janice Cardwell, PhD, campus V.P. Dr. Bonnie Ellis, regional director of academic affairs, Katherine Temple, associate faculty, and Anita Hicks, associate faculty, to present at local Knowledge Without Boundaries workshops and at the Association of Leadership Educators (ALE) July Sacramento conference. Cardwell, Ellis, and Temple also presented at the July 2017 KWBA session. “Detroit’s contributions to the work that the CLSER produces has been remarkable,” says Erik Bean, Ed.D., CLSER's Associate University Research Chair. Several fellows received letters of accepted for publication. These include Dr. Jason Flora’s study Scholarly leadership as a function of the doctoral mentoring relationship in the International Journal of Dissertation Studies (IJDS), and Dr. Heath Boice-Pardee’s study Enhancing the student experience through co-creation in the Journal of Recruiting and Retaining Adult Learners. Fellows Patricia Bleil and Erika Burton continue to collect their study data and prepare their manuscripts for publication. 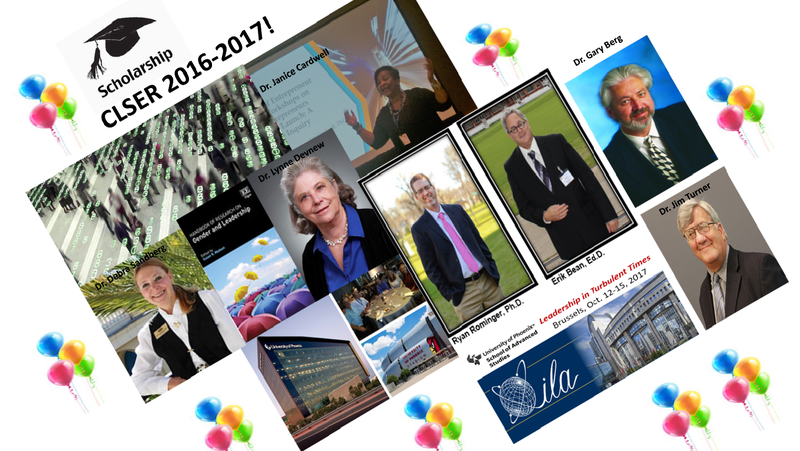 Other CLSER fellows and affiliates had much to celebrate with the publication of their studies as well as other appointments. Dr. Gary Berg completed his mixed methods study that examined the non-academic challenges, the role of mentors, and impact of degree completion on minority students in online doctoral programs. Berg told Ryan Rominger, Ph.D., CLSER's Associate University Research Chair, “During the year of my fellowship I was able to conduct a very large study on the experiences of underrepresented students in online doctoral programs. It is to my knowledge the largest study of its kind undertaken thus far.” Berg’s paper was published last December in the American Journal of Distance Learning. Numerous other CLSER affiliates published and presented through the year. We wish we had more space to comprehensively list them. Congratulations to all! Also published in December, Dr. Erik Bean’s research dubbed, An Academy Customer Experience Benchmark Study in the Internet Learning Journal, Policy Studies Organization. In May Dr. McCaslin appointed Bean associate editor of the Leadership Studies Journal overseeing its new section entitled Practitioner Perspectives. The new section will soon announce a call for articles that align to Boyer’s Model of Scholarship specifically in the areas of discovery, integration, and application in the field. In addition to this new role, Erik will be presenting four times at ILA Brussels. Over the past year Dr. Bean also presented at numerous conferences including Creating faculty Personas for a variety of survey analysis measurements at STEMTECH - League of Innovation in the Community College, Using technology and feedback to embrace immediacy and customer experience (CX) principals at the Online Learning Consortium Accelerate Conference, Documentary investigation of the cultural competence exhibited at an African American weekly newspaper at The 8th Annual Qualitative Report Conference, Popular yoga poses aligned to research agenda setting at GlobalMindED, and several presentations at KWBA. He has been accepted for presentations at E-Learn (Association for the Advancement of Computers for Education), Managing your scholarly reputation score (co-authored with Drs. Ryan Rominger and Fiona Sussan, University Research Chair for the Center for Global Business Research) in October and the 9th Annual Qualitative Report Conference, Research agenda setting yoga soliloquy (co-authored with Dr. LauraAnn Migliore, Fellow for the Center for Learning Analytics) in January 2018. Erik also had a chapter accepted for publication in the 2018 IGI Global book, Driving customer appeal through the use of emotional branding. Finally, Erik was asked to develop a new University of Phoenix course, CEM/330: Leading Customer Experience (CX) Teams, for a new business school undergraduate certificate program in CX. The program is expected to roll out in the fall of 2017. In addition to E-Learn presentation acceptance and presenting the KWBA workshop on scholarly index scores via Google Scholar and ResearchGate.net as noted, Dr. Rominger co-published a multiple-case-study with Canadian Psychiatrist Dr. Tony Benning. The article entitled Patients' disclosures of near-death experiences and other anomalous death-related phenomena: Perspectives from a general psychiatric clinic, appears in The Journal of Near-Death Studies 34(4). He also co-presented a 5-hour workshop with University of North Texas Counseling Program Chair Dr. Janice Holden on Integrating spirituality into clinical practice at the annual ACISTE conference, held in Palm Springs last October (2016). More recently Dr. Rominger presented the results of his literary meta-analysis on innovations in doctoral education over the past 10 years at the KWBA. What’s in store for next year? CLSER is looking forward to a productive 2017-2018 academic year with the introduction of its much-anticipated Special Interest Group (SIG) dubbed AIM, Active and Inactive Military Personnel – Leadership and Education. John Carroll, Ph.D., University of Phoenix academic affairs director, Austin, Texas campus, has agreed to lead the charge for applicable research projects important to the military. The new SIG complements other CLSER SIGs, Women and Leadership, Innovations in Higher Education, Research Methods, and Leadership Studies that have allowed CLSER to net the widest catch of all the sister research centers. The availability of new fellowships will be announced after September 1. Standby to see the positive impact that CLSER is expected to make throughout the next year. Better yet, join CLSER by becoming an affiliate today. Get involved, start networking, and make your scholarly mark!